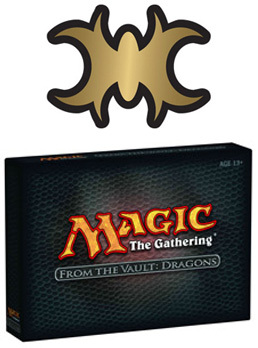 Celebrate the 15th Anniversary of Magic: The Gathering with the “From the Vault: Dragons” limited edition boxed set. Inside, you’ll encounter 15 dragon cards printed in distinctive foil. Released in 2008, From the Vault: Dragons includes 15 black-bordered premium foil dragon cards, each printed with a distinctive finish. Six of the cards feature new artwork and all cards are legal for tournament play. The set includes a full-color collector’s insert that includes a list of every dragon card printed in Magic’s 15 year history, rules for the Elder Dragon Highlander casual format, and a brief description of each of the 15 dragon cards. It also includes a spin-down life counter featuring the From the Vault: Dragons expansion symbol.